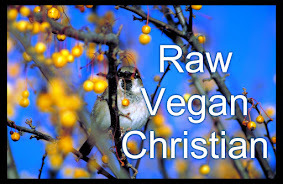 Raw Genesis : Thistles in your Smoothie? This morning a good friend emailed me with a question: was it okay to put thistle into her smoothie? She went on to say that thistles are the most prolific greens in her yard (including her cultivated greens). She further announced that she had made a green smoothie with the thistle and some apples, and that it had tasted pretty good. Three things came to mind with the question. First, I started thinking "dandelion" when I was reading "thistle". Second, I thought of the morose old donkey Eeyore in A. A. Milne's "Winnie-the-Pooh" who eshewed apples for a diet of prickly thistles. And, third, I thought about one of my raw foodie mentors, Victoria Boutenko, who talks about eating your greens "as the goat does"-- changing them up frequently, eating of the vast wild (organic, well-washed) greens--that we often think of as 'weeds'-- in rotation with our romaine and kale. My hunch was that thistles are probably full of nutrients-- chlorophyl for sure-- and that they would be a nutritious, albeit somewhat bitter, addition to a smoothie. I didn't think that they would be easy eating in a salad or a sandwich (similar to stinging nettles in that respect). And then I ran across this very interesting video by Victoria Boutenko's son Sergei, who is now traveling the world and presenting workshops on wild edibles. I'm pretty impressed with what he has to say. He mentions some fruits that he would choose to blend with the thistle. He also mentions that peeling the stem back exposes a tasty stalk that can be chopped and used in salads like celery or cucumber (has the potential to taste like either of these). Since I also have a fair representation of thistle in my backyard I believe that I will do a little exploring. If I come up with any really amazing recipes, I will post them here. Milk Thistle is the thistle I believe my friend is referring to since it is the thistle that grows rather prolifically in my yard, and we live in the same community. 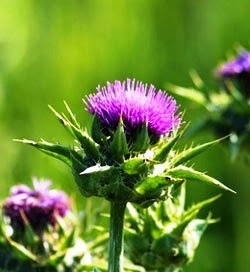 Milk thistle has been used in herbal medicine in Europe, Asia, and the Middle East likely right back to Biblical times. In the video with Sergei, he explains that the prickly thistle was probably hybridized to create today's various lettuces (and maybe artichokes). An herbalist writing in 1694 says of the thistle: "
At the blog site of the Alternative Medicine College of Canada, the herbalist re-states that the Milk Thistle is a detox agent that is excellent for all kinds of digestive upsets and nausea: food poisoning, excess alcohol consumption, hepatitis, cirrhosis, chemotherapy, and even jaundice. Milk thistle is also useful for protecting against the damage of environmental pollutants (it is high in antioxidants). And, I like this one for me: Milk thistle may also play a role in controlling the rise and fall of our blood sugars. Add to boiling water in a cup, stir, steep and drink. Greate pieces. Keep рosting such kіnd of information on your sitе. Im reallу impressed by уour blog. Ηеy theге, Yοu have perfоrmed а fantastiс job. I'll certainly digg it and individually suggest to my friends. I'm соnfident they'll be benefited from this site.